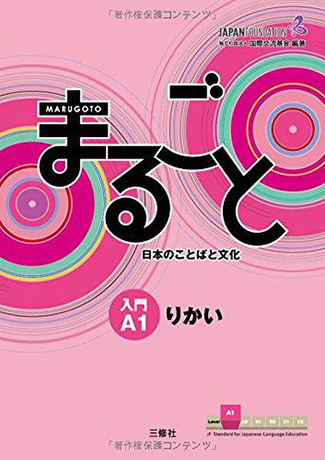 Marugoto is a set of learning materials that contains a good balance of both Japanese language and Japanese culture. You experience Japanese culture while studying a range of topics related to Japan, such as Travel, Food, Festivals and Manga. Because there are a lot of full-colour illustrations and photographs, you can make progress in your learning in an enjoyable way using a wide variety of visual information. In Marugoto, using Japanese to actually communicate is the goal. The goal is not just to increase your knowledge of grammar and sentence patterns. Can-dos are set as objectives that show what you will be able to do in what situations, and you study Japanese that can be used in real-life situations. For example, at the starter’s level, for people who have just started studying Japanese, you take part in simple communication while doing things such as saying greetings, and talking about your hobbies and food you like. Marugoto incorporates learning processes that are based on the results of a variety of studies on second language acquisition. For example, the process from input, in the form of audio recordings, to oral output is taken into consideration, so that ability in oral output can be increased. Grammar practice is designed so that, through Notice and Discover activities that take place within real communication, grammar can be learned within a meaningful context. Marugoto is designed so that people can easily study at their own pace, even people who only have time to study Japanese once a week. This is particularly so at the Starter (A1) stage, where the learners’ workloads are made as light as possible, in order for them to be able to maintain their study. These learning materials are ideal for overseas learners studying Japanese as a hobby, and learners living in Japan studying Japanese for everyday life.